THE back page of the Sun News-Pictorialposed a question many Melburnians were asking on the day before Collingwood’s 1981 preliminary final against Geelong. It centred on a young footballer few had heard of – “an unknown teenager”, as the paper called him – selected on the interchange bench for his VFL debut match in the second most important game of the season. Carrying on a grand Collingwood tradition of debuting players in finals – just as the club had done with young ruckman Len Thompson in a preliminary final 16 years earlier – the bolt from the blue in 1981 was Noel Lovell. It was one of the great footy shocks of the season. But unlike Thompson, who went on to a long and successful career with the Magpies, Lovell’s time at Victoria Park was fleeting. 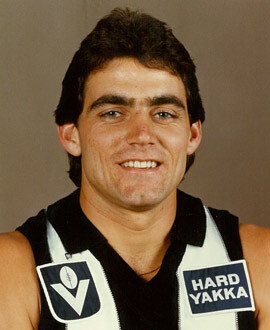 He only played 16 senior games for Collingwood across four senior seasons, as well as four with Richmond in his part of the revolving door that seemed to exist between Victoria Park and Punt Rd throughout the turbulent 1980s. That development unfortunately never came. So the story of Noel Lovell’s career still centres around his debut in a preliminary final, and his second game a week later in front of 112,964 fans. Lovell was the product of the strong Preston and District Junior Football Association, which supplied a steady stream of Collingwood footballers. But his pathway to the Pies was different to some of the others who joined him there. Initially, as a kid playing with Preston RSL, he was overlooked by the Magpies. But when one of his junior teammates who had already attracted Collingwood’s attention “badgered” the club about Lovell, they had no other choice but to listen. The would-be recruiter was none other than Peter Daicos, who had played most of his junior football with Lovell and was six days older. As the Agereported after Lovell’s debut in 1981: “There is more to Collingwood’s Peter Daicos than his breathtaking football. Daicos (said) proudly after his four-goal performance in Saturday’s preliminary final that he was the man who had recruited first-gamer Noel Lovell to Collingwood. Lovell had played two seasons in the under 19s in 1979 and 1980, before working diligently in the reserves ahead of getting his lucky break. His good fortune came from the bad luck of veteran back pocket Stan Magro, who injured his left thigh on the Thursday night before the preliminary final. An injury to Ross Brewer saw Lovell brought into the game earlier than expected, during the second term. It was said he “conquered his nerves to perform with credit”, having nine disposals in the No.54 jumper – though theHerald still called him “Nigel” Lovell after the game. Lovell retained his position for the Grand Final, where he grabbed eight disposals, and his two late games were enough for him to win the club’s best first year player award. He switched to No.16 and played the first seven games of 1982 season, including a career-high 25 disposals against Fitzroy in Round 6. But just when he looked to have secured a spot, luck went against him. Against Essendon, at Windy Hill, he had three early disposals in the first 12 minutes before suffering a broken collarbone. It was a sign of things to come. Shoulder injuries derailed his career. He missed the rest of 1982, played just six games in 1983, and could muster only one game the following year. He transferred to Richmond for two seasons, playing a further four games with the Tigers before being forced into retirement owing to more injuries. Noel Lovell’s career began against a spectacular backdrop, but frustratingly his battle with his body meant he never got the chance to have a more sustained VFL career.